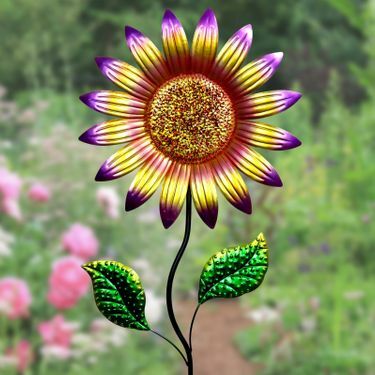 Add a huge burst of metallic color to your garden with this beautifully hand painted Metal Sunflower Garden Stake. Ombre details of red, yellow, and pink in the petals and green leaves sprouting from its stem make this sunflower a bright and delightful addition to your garden! Made of durable metal, hand painted and UV treated to resist fading. Impressive and gorgeous! Size: 15.75" x 1.25" x 56" H.